Get online payments through debit cards and credit cards with Sage Pay in the United Kingdom. Need to Buy a Support License for the Sage Pay Payment Gateway for Event Espresso 4? Download the latest version of the Sage Pay payment gateway for Event Espresso 4 from your Event Espresso account. Your credentials for Sage Pay will be assigned by Sage Pay support. You’ll be provided with your Vendor name. This information can be entered in the payment methods page for Event Espresso within your WP dashboard and then click on the Update Settings button. You’ll then be ready to accept payments on your site. 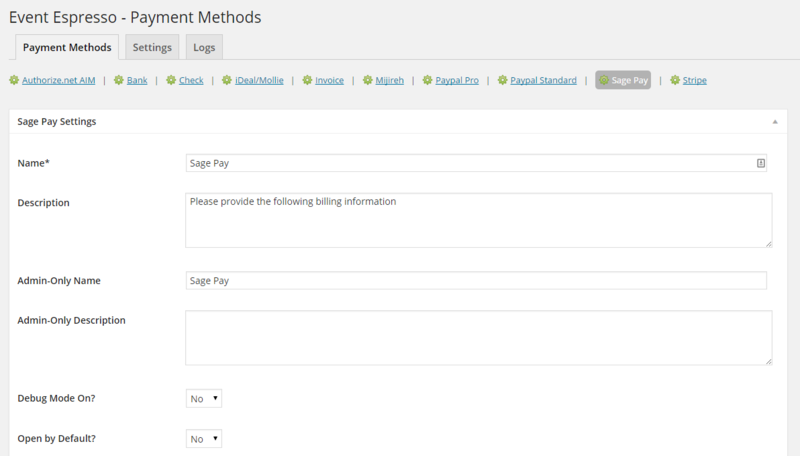 Note: If you need to test Sage Pay, then you can enable debug mode through the payment method screen. Also, be sure to whitelist your web server’s IP address via the test area for MySagePay. There is a separate login area for MySagePay for testing. After you are finishing testing, be sure to turn debug mode off and save changes. 3) Click the ‘Add’ button on the bottom right of the form. 4) Input the details of your webserver and add that IP to the list. The IP address used in the example below is not a valid public IP Address, your web servers IP address will be different to this. Will Sage Pay be the only payment method enabled or the only one you offer? Click here to learn how to make it selected by default during the registration checkout. An account with Sage Pay is needed to accept payments via Sage Pay. Login to your WP-admin (WP Dashboard) and go to Event Espresso –> General Settings –> Payment Methods. Once on the Payment Methods screen, click on Sage Pay and click on the button to activate the payment method. Sage Pay Vendor Name – This credential is needed to process payments and can be found in your Sage Pay account. Credit Card Types – These settings determine the cards types you will accept through the gateway. By default the payment gateway will ask for a full address including a state/province and a zip/postal code. The changes in the link above are suggested if you will be having registrations where your attendees/registrants may be from a country that does not use a state/province and/or a postal/zip code. The Sage Pay payment gateway will let you accept payments via major credit or debit cards such as Visa, MasterCard and American Express. This is an onsite payment gateway which means that attendees and registrants will pay for their event registrations on your website. An account with Sage Pay is needed to accept payments via the Sage Pay gateway. I configured Sage Pay and payments are not being processed. Can you help? Check you have added your servers public IP address to your ‘Valid IPs’ within your Sage Pay account and that this is the correct IP address, you may need to contact your hosting provider to confirm this. How can I set up a recurring payment or subscription through Sage Pay? Recurring or subscription payments are not currently supported in the Sage Pay payment gateway. When I refund a payment, does it also refund through Sage Pay? 2) Then login to your Sage Pay account and process the refund. Is an SSL certificate needed for Sage Pay? View more information on PCI compliance from Sage Pay.